When we originally developed the Hurricane Inductionkit for the Elise S1, we couldn't even think of the succes this product would have in the market. After the introduction of the Elise S2, we have modified the air-inlet to make the system work for the new model aswell. So far so good... now the Toyota VVTi engine has arrived for the Elise, Exige and Federal Elise, we have had to change more to get this working. This kit will be delivered including our new and reshaped air-inlet and a specific adapter for the VVTi air-mass sensor. Not only will this kit improve the soundtrack of your car, it will also help to find some extra power and torque which is in the engine but doesn't come out in the standard configuration. 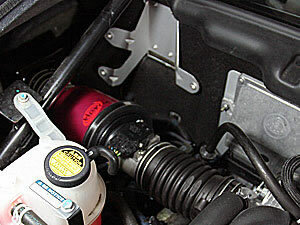 For optimal performance, we recommend the use of a Hurricane Inductionkit and a sports exhaust. This kit comes with an Aluminium Filtercan.